PEUGEOT FRACTAL is an electric urban coupé revealing a prospective design of the PEUGEOT i-Cockpit® that explores another of the senses: following on from visual; embodied by the head-up display, and touch; with the compact steering wheel and touchscreen, PEUGEOT FRACTAL showcases unprecedented attention to acoustics in automotive design. The result is a level of auditory perception that further enriches the driving experience. PEUGEOT FRACTAL’s head-up display features a high-definition holographic screen and a 45-degree polycarbonate strip that delivers additional information and creates an impression of depth. This allows the driver to customise the way information is shown. 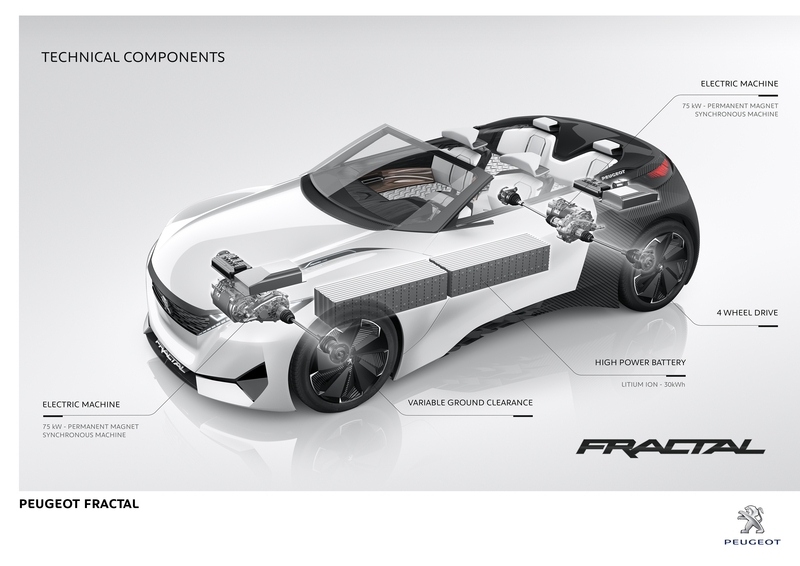 PEUGEOT FRACTAL is an ideas incubator that explores new design and manufacturing processes. 3D-printed parts represent more than 80% of the interior trim surface. The anechoic materials were made through generative design – a process used to achieve the perfect component. The PEUGEOT FRACTAL’s styling also embodies the car’s ease in an urban environment, which is reflected in the dynamic lines that flow along the length of the smooth body. The Coupe Franche, a straight line dual paint finish, further enhances the sense of vitality with a sharp shift from intense white to matt black at the door hinges. The upper body features a removable roof to turn the coupé into a cabriolet. PEUGEOT FRACTAL has a unique sound signature to keep it in sync with other road users, especially pedestrians and cyclists: any pedestrians about to step out into the road without looking will be alerted to the PEUGEOT FRACTAL’s presence. The concept also makes everyday life easier for the vehicle owner through the use of a Samsung Gear S smartwatch, which provides continuous information on the status of the battery, charging time, interior temperature and vehicle location. The watch gives the driver one-touch access to open the doors and customize interior features such as the air conditioning and sound system. 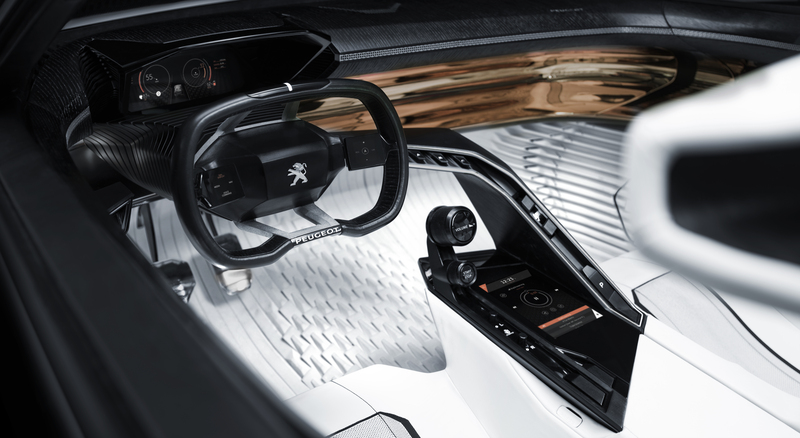 To ensure constant control, the driver’s seat provides kinaesthetic feedback based on the PEUGEOT FRACTAL’s handling. The intuitive, compact steering wheel features a touchpad integrated into each of its two spokes. These thumb-controlled sensors control a range of PEUGEOT FRACTAL functions and equipment. The anechoic surfaces cover more than 15 square metres of the cabin interior and were produced by generative design. The computing power of today’s machines makes it possible to explore all variations of shapes and structures for a given part. Generative design creates efficient shapes and develops the perfect part in each case through the use of algorithms. PEUGEOT FRACTAL uses just the right amount of material to ensure acoustic efficiency. Spatialisation ensures that the sound matches the morphology and path of the vehicle. The system developed by StelLab configures the different sound sources separately for the PEUGEOT FRACTAL’s coupé and cabriolet modes. Developed by SUBPAC, an American start-up, the tactile bass system offers a new physical sensory experience, which allows the bass to travel through a solid medium rather than through the air, meaning the sound waves reach the inner ear through the listener’s body. This gives the seat occupant a more immersive and personnalized bass experience, without causing unwanted interference in the surrounding environment. PEUGEOT FRACTAL also imbues the electric drive train with its own acoustic identity, a world away from any associations with internal combustion engines. PEUGEOT brought in Brazilian sound designer Amon Tobin to rise to this specific challenge. The PEUGEOT FRACTAL’s external sound signature keeps it in sync with other road users, such as pedestrians and cyclists, who are alerted to the car’s presence by different sounds specific to the vehicle’s status: acceleration, deceleration and cruising speed. PEUGEOT FRACTAL is the fruit of collaboration between artists exploring new horizons. We worked with the designers to pool our resources of inspiration. 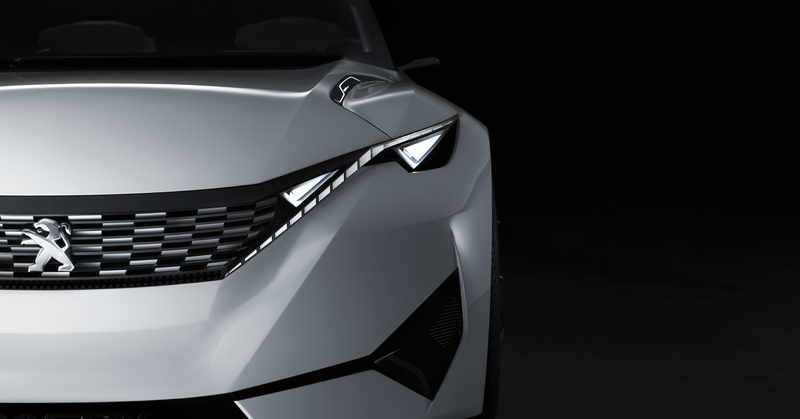 The style is inspired by the sound, and my design draws on the PEUGEOT FRACTAL’s looks and materials. The way in which spatialisation and the quality of this installation enhance the driving experience is evident in Amon Tobin’s acoustic set-up. PEUGEOT FRACTAL is unique, the result of the successful collaboration between the artist and the PEUGEOT Design team. The electric drive train optimises aerodynamics and includes features unprecedented in the segment. The PEUGEOT FRACTAL’s overall balance has been improved by installing the lithium-ion battery in the central tunnel. This recentres the vehicle’s weight and lowers its centre of gravity. The four-wheel-drive electric steering ensures outstanding efficiency in the city and stability at high speed. The air springs can function automatically or be controlled by the driver to adjust ground clearance between 7cm and 11cm: the lowest position optimises aerodynamics on the road and extends the PEUGEOT FRACTAL’s autonomy; the highest clearance allows the car to negotiate city streets with ease and take speed humps and car park entrances in its stride.